A seven-year veteran of the National Football League has been chosen as the new director of the UO’s Warsaw Sports Marketing Center in the Lundquist College of Business. Whitney Wagoner will become the center’s first-ever female director beginning Aug. 1. 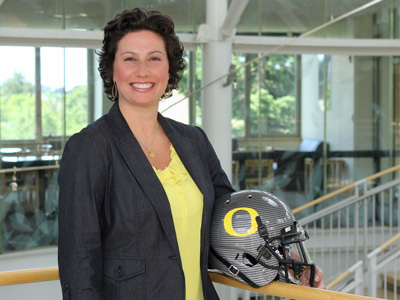 In addition to her time with the NFL, Wagoner has spent more than 10 years teaching sports business at the UO. Wagoner will oversee both the master of business administration program and the undergraduate degree in sports business within the Warsaw Center. She also will be responsible for overall operations of the center, including industry partnerships, coordination of student-based activities, alumni engagement, student recruitment and placement and other tasks. For the full story, see “Warsaw Center Names New Leadership” on the business school’s web page.